Originally printed on April 15, 2019 in the Evening News. 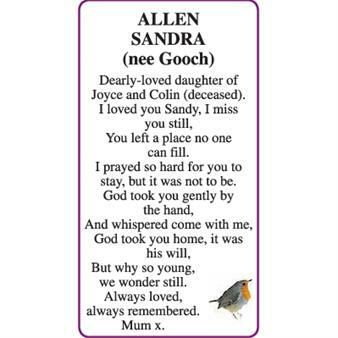 ALLEN SANDRA (nee Gooch) Dearly-loved daughter of Joyce and Colin (deceased). I loved you Sandy, I miss you still, You left a place no one can fill. I prayed so hard for you to stay, but it was not to be. God took you gently by the hand, And whispered come with me, God took you home, it was his will, But why so young, we wonder still. Always loved, always remembered. Mum x.